On September 30, 2016, The Music District opened its doors in Fort Collins, Colorado. While the name harkens to legendary performance spots like Memphis’s Beale Street or Austin’s 6th Street, the moniker is a bit misleading. The Music District isn’t exactly a main street for audiences craving music in tourist worthy locations with sticky floors, nor is it legendary. Not yet. The Music District is a music-centered gathering space: a (mostly) free incubator and one-stop shop for innovative artists, businesses and networks. It’s the newest project out of The Bohemian Foundation, whose mission calls for empowerment through community-building across civic, humanitarian and art-forward grants and programs. The foundation’s commitment to building community through music is already well established: Its Bohemian Nights encompasses a free concert series showcasing local artists as well as ticketed shows featuring national acts, and it’s music fund offers non-profits grants to hire musicians for events at market rate. But The Music District is the foundation’s sexiest project yet. The 57,000-square-foot campus consists of five buildings: The Two Sisters, Little Brother, Carriage House and The Long Building. The Two Sisters, originally two structures now conjoined by a spacious foyer, comprises the main entertainment and practice space. 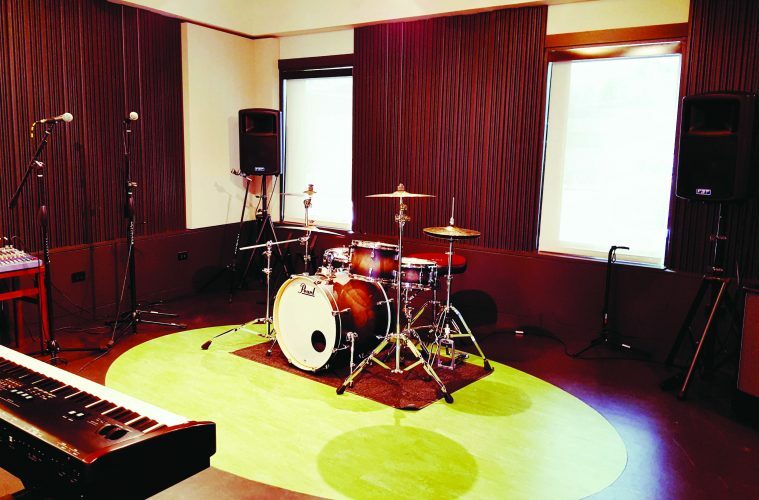 It’s divided into a quaint live performance venue and a three story state-of-the-art wing with customizable rehearsal rooms. Musicians can make use of everything from workshop and meeting spaces to a first-spin station to first-come first-serve creative spaces and more. There’s also a top-of-the-line kitchen with enough kitch to make Elvis feel at home. According to director Jesse Elliott, the design of The Music District included extensive community input so as to support, rather than compete with, local businesses. 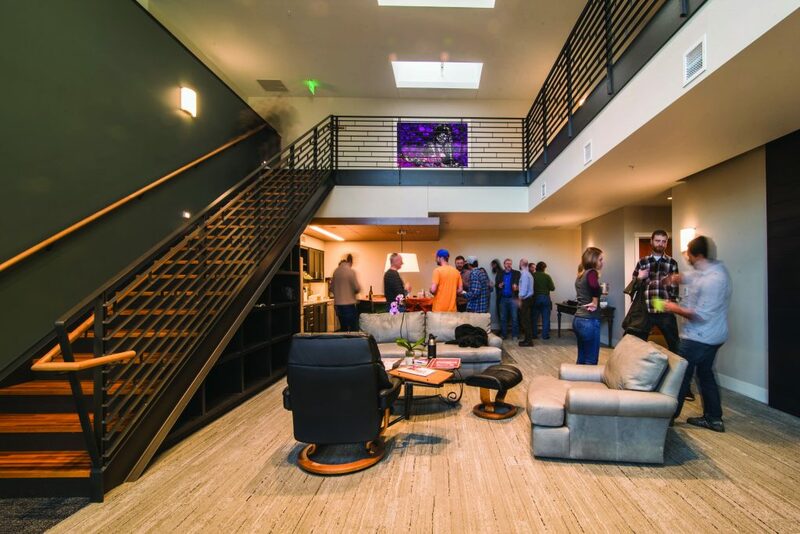 While the initial concept included a multi-million dollar recording studio, “we found great studios already existed, everything from garage studios to the Blasting Room,” he says. He adds that what musicians really need is support with pre-production that complements available resources. 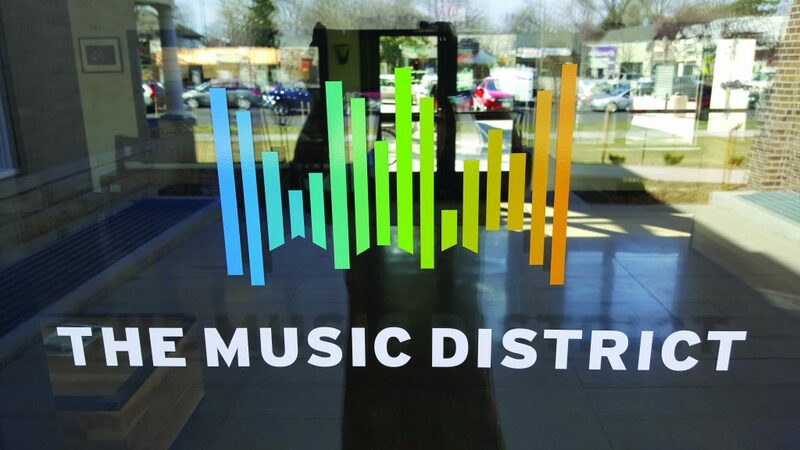 The Music District does this by offering musicians the space, training, and technology that they need to hone their craft for free or a small fee. Public events here are always free and they promote the community-minded mission. Upcoming offerings include such wide ranging bits as a “So You Wanna Be A DeeJay” workshop to a “Community Barn Dance” sponsored by the Central Rockies Old-Time Music Association to a screening of Hedwig and the Angry Inch. “Three-fourths, maybe more, of the workshop concepts and programming come from the community,” says Elliott. The Two Sisters working space and events calendar may be impressive, but they are only the beginning when it comes to how The Music District aims to change music as an industry and an art in Colorado and beyond. The Carriage House and the Long Building both offer low rent digs to music industry business tenants as well as affordable co-work spaces. Current tenants include volunteer-powered KRFC 88.9 Community Radio, which was housed in the Long Building before it became part of the District. It’s also home to The Scene magazine and a host of fresh event production, management, and consulting companies that run the gamut from artists to businesses. Little Brother houses the Woodshed Music retail store, which specializes in new and consigned instruments, and two apartments that currently house panelists/guest speakers and performers but will eventually accommodate artists-in-residence. The Music District plans to reach beyond Colorado, too. This fall, it will participate in One Beat’s (1beat.org/) international cultural exchange. One Beat’s mission to “cultivate a pioneering international network of leading artistic, technological and social innovators in music” by “bringing together emerging musical leaders from around the world to collaboratively create original work and to develop a global network of civically engaged music initiatives.” In October, The Music District will host 25 One Beat artists from around the world for their final week in U.S. In what feels like an increasingly pay-to-play Colorado, The Music District reminds us why we fell in love with the state in the first place. Before the word gets out, we suggest you stop in for a banjo lesson. Or ten. Visit the The Music District at 639 South College Avenue, Fort Collins, CO 80524. YOu can register for events online at themusicdistrict.org/calendar. To learn more about the work of the Bohemian Foundation head to bohemianfoundation.org.